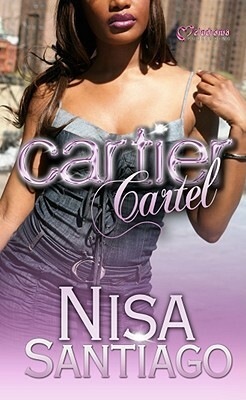 Next up for me in library land is Nisa Santiago’s Cartier Cartel. I know this book was published several years ago; I am extremely late, but for some reason I just never read it. Ok, I lied. I enjoy street lit, but originality is lacking now, in my opinion. So she, meaning me, overlooked this book and series. Yet, despite my apprehension, it is still very popular at work, and I had added it to a street lit series book list, so I decided to finally read it. I must know the books I am adding to lists for patrons to read! Thankfully, I cannot say that I was disappointed by finally reading this book. The quick rundown: Cartier, yes that’s her name, is tired of being broke and hungry and wearing raggedy clothes. Her mama, Trina, is tired of supporting her, and hey, at 15, mama was playing house with her own man and not relying on folks to take care of her. Why can’t Cartier do the same? Now why did mama go and say that? Cartier then teams up with her girlfriends and starts boosting with some older chicks. That eventually didn’t work out so the girls formed their own thing, the Cartier Cartel, and really started making moves. However, the girls make the wrong move, which ends with Cartier in prison. Now we all know how this goes: While in jail, her friends move on, she’s depressed, and alla that stuff. What is helping her do her time is her relationship with her mother, which improved, and her new man, Jason, who always had a crush on her. Cartier is released from jail a new, different person, but the game is still the same and there is no honor among thieves, or those we used to know. I liked this book! Yeah, I admit it! I am glad I added it to the street lit book series list I made at work, too. This open-ended, fast-paced book features lots of betrayal and redemption. What I liked the most was that the whole story line was different. Usually in street lit, the girl is insanely beautiful with long hair; she’s dating the most popular hustler and yadda yadda. Cartier is not quite like that. And let me go there for a second, please. Seriously, though, I did roll my eyes several times because of these project names. Cartier, Fendi, Prada. Girl, please! Ok, let me bring it back. So, we watch Cartier grow into a different person. As we all know by now, she gets knocked and is sent to jail. Instead of Cartier just going off to jail and emerging the same ol’ chick and not learning anything, she really got herself together and wanted to make a better life and right her wrongs. I understood why she got into the game and why she made the decisions she made. Trifling mamas, I tell ya. Anyway, she was a young, she really didn’t know any better. And when you are poor and starving, you will do what is necessary to survive. I didn’t agree with her going to jail but it made her a better person in the end. I respected why she did it. Conversely, the other characters, chile, I didn’t like them. Monya knew better! I was shocked but not really. What really got me was…wait, I can’t tell you! I don’t want to give it away. Let’s just say in addition to betrayal, there are several surprises in this book, at least it was for me. I don’t know how I feel about Jason. I have to keep reading to see if he really changed his ways or not. Initially, I thought he would be good for Cartier, but I don’t know how their story will end just yet. I gotta keep reading the rest of the series! Trina, tho… I started to actually like her more as the story went on. Redemption honey! In short, I will be reading this series! I enjoyed it and I sure hope the other books are just as entertaining as this one.